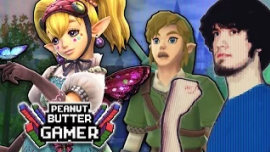 As the third and newest video for this year’s Zelda Month, PeanutButterGamer decided to play the recently released Hyrule Warriors, going over all his thoughts on the game, its story, and its characters. So far in the month of November, he’s made two other videos: the first comedically hacking Ocarina of Time, and the second talking about the famously awful Zelda cartoon from the 80’s. This year marks the fourth annual Zelda Month by PBG, so if you’re interested in checking out more of his Zelda content, you can watch his Top 8 Zelda Dungeons video from last year, or his Top Ten Zelda Bosses list from the year before that. What do you think? Are you excited for the rest of PBG’s Zelda Month, or sad that it’s almost over? How do you feel about how the video portrays Hyrule Warriors?